A towel with an extreme thirst! The Griot's Garage Extra-Large PFM Edgeless Drying Towel is designed to make towel drying your car as easy and as fast as possible. With over 1,000 square inches of surface area, the Griot's Garage Extra-Large PFM Edgeless Drying Towel is plenty large enough to dry the entirety of your car without much wringing. The Griot's Garage Extra-Large PFM Edgeless Drying Towel boasts a hefty 1,120 GSM that is sure to make this one of the most absorbent drying-towels you've ever used! The edgeless, double-ply design of the Griot's Garage Extra-Large PFM Edgeless Drying Towel ensures that your precious and sensitive paint is safe at all times. When selecting a drying towel for your weekly maintenance washes, you need to be extra careful to ensure you get one that is going to be capable of handling that job. Drying off all the water that you have to drench your car in during your wash requires quite an absorbent towel. Most drying towels you'll find on the market today don't have near the absorbency needed to tackle all that water. The Griot's Garage Extra-Large PFM Edgeless Drying Towel is one of the most absorbent microfiber towels that you can find! 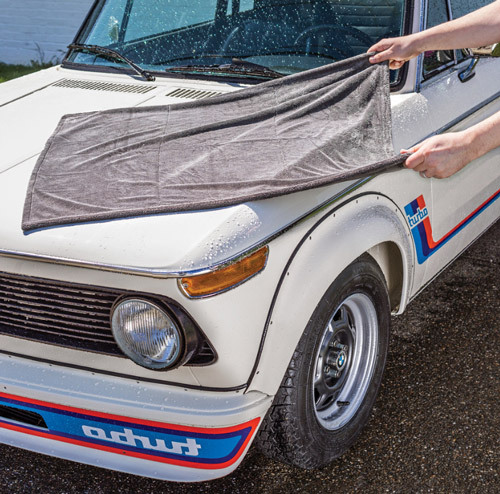 The Griot's Garage Extra-Large PFM Edgeless Drying Towel is designed with an incredible 1,120 GSM that will easily drink up any and all water that it comes into contact with. With a 29” X 36” size, the Griot's Garage Extra-Large PFM Edgeless Drying Towel ensures that it has plenty of capacity to store all of that moisture as well. You will find, when using the Griot's Garage Extra-Large PFM Edgeless Drying Towel, that the frequency with which you need to wring out the towel is greatly reduced. Pair that with the fact that your will hardly ever need to switch to a different towel and you are saving a hefty chunk of time drying your car! Many in the detailing world are rightfully scared of using microfiber towels to dry their cars. Historically, microfiber has been known for increasing the risk of wash-induced swirls due to the potential for the edges of the towel to scratch the surface. The Griot's Garage Extra-Large PFM Edgeless Drying Towel avoids the scratchy edge by avoiding the need for an edge all together! The only thing that will touch your paint while using the Griot's Garage Extra-Large PFM Edgeless Drying Towel is ultra-soft, long-looped microfiber!